Go to the transaction Article Master [Artikelstamm] (BAS02) and select an article. In the article, go to the tab Marketplaces and select the required marketplace/shop. Go to a tab in a marketplace and activate the marketplace for the item. Set a check mark in the checkbox active for this. Fill in the remaining fields if desired. reybex takes over the data from the article master. Note: If you import categories and read these categories from the shop/marketplace a second time, deleted categories in the shop will not be deleted in reybex with this import. Articles in reybex can still have the deleted categories as selection. Your customers want to know how long they have to wait for the ordered products. 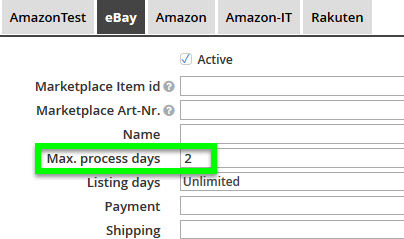 Therefore you can set the maximum process days for the orders in reybex in the article master. This information is synchronized to your marketplaces/shops.